Being a less than enthusiastic fiction reader when I come across a novelist I like I tend to crow about it. Lisa See is just this type of novelist. 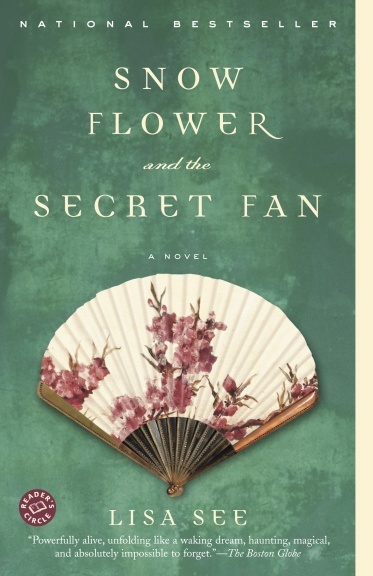 After reading and enjoying Shanghai Girls I went back to read Snow Flower and the Secret Fan and have since then been buying and saving her other novels, not wanting to run out! I have bought several copies of Snow Flower and the Secret Fan to give as gifts and have passed Shanghai Girls onto friends to borrow. I love a novel that I can learn something from and See’s research into Chinese history and her well crafted books made me an instant fan. I highly recommend you give one a try and they’d be super book club choices too, lots to discuss in both books. Bravo! The statistics on sanity are that one out of every four people is suffering from a mental illness. Look at your 3 best friends. If they’re ok, then it’s you. If you want to learn some computer tips but don’t want o be overwhelmed you may want to check out these articles. Written in easy to understand language they will help you to feel more proficient when using your computer. Three Tips for More Effective E-mail from PC Magazine explains some things you may not know about e-mail or hints you may want to pass along to your less informed relatives and e-mail pals who sent you e-mails with all the recipients disclosed etc. From the New York Times, 10 Simple Google Search Tricks I’m sure you can use these on BING too, my search engine of choice. From Slate Magazine, Fix Your Terrible, Insecure Passwords in Five Minutes something that should be done at least once a year if not more often that we always say we are going to “get around to” but often delay.